« 25 Top Canadian Business Women: What’s Their Secret? 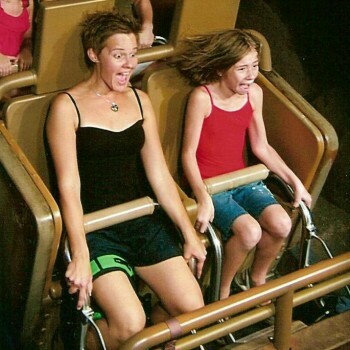 What a priceless snapshot of my niece, Rita-Marie, and I on the Expedition Everest roller coaster at Disney World. 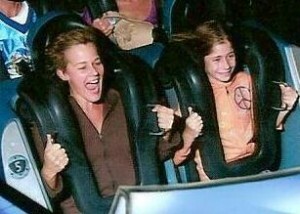 I have been on many roller coasters in my time, however this was Rita-Marie’s first experience. I was delighted to be beside her as she plunged into the unknown for the first time. Her face says it all! Life is like a roller coaster. You enter with anticipation and anxiety, excitement and the unknown. Spiritually, allow the universe (in this particular case Auntie Judi) to guide and hold your hand. Your emotional roller coaster will provide its own seat belt. Seconds after the first ride was finished, Rita-Marie asked if we could go again! Check out the smile she was sporting by the time we got to the Rockin’ Roller Coaster. Like her Auntie, she is enjoying the ride! Great analogy! Loved the message and the pictures!